First you should download the Eclipse for Java EE Developers from the Eclipse Download page. 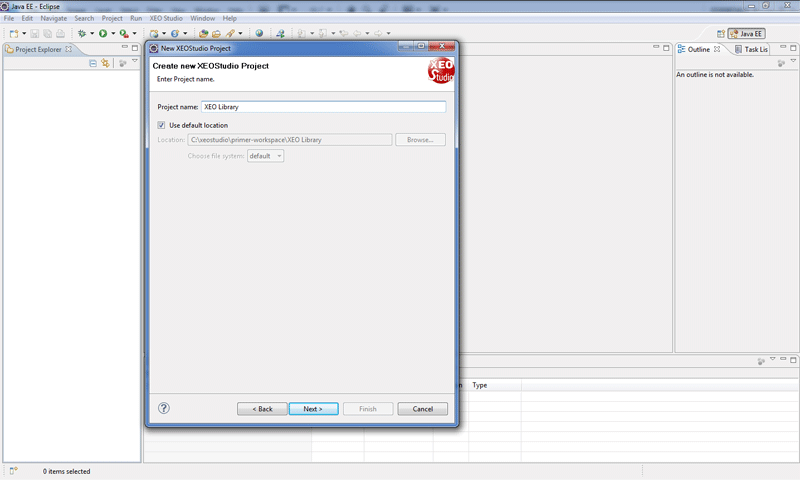 To install the XEO Studio plugin just copy the XEOStudio.jar to the Eclipse plugins folder and start/restart Eclipse. A JDK6 must also be installed and _configured_ to create a XEO Application. To configure the JDK in Eclipse go to the Window Menu -> Preferences -> Java -> Installed JREs, click "Add", select "Standard VM" and for the JRE Home option choose the path to your JDK6 directory and click Finish. Then, check the box for the JDK in the list so that the JDK is the default JRE. Note: The XEO Studio.jar file comes bundled with a release of the XEO Framework, however not every XEO Framework release originates a XEO Studio release, so do download the latest stable release. Save the configuration file and restart MySQL. 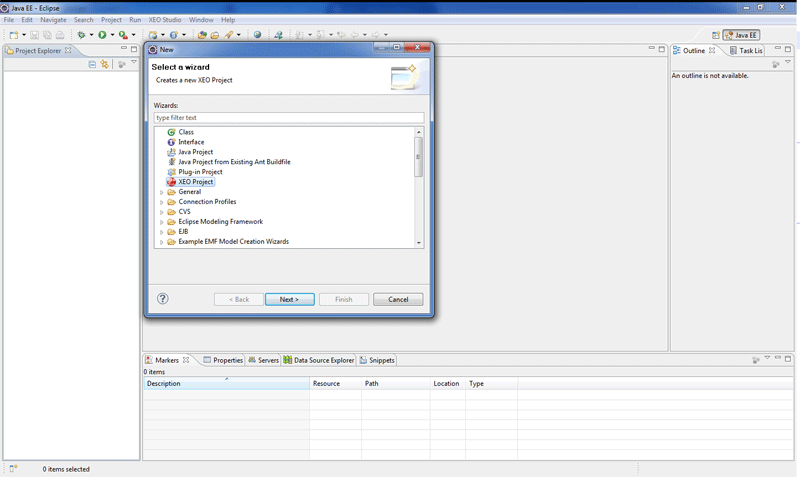 In order to use JBOSS as a development tool with XEOStudio you must run Eclipse as an Administrator user. Right-click the Eclipse executable and select "Run as Administrator". If you don't do this, XEO Studio won't have permission to create some symbolic links and copy some files in JBOSS's folder. Next, you'll be presented with the screen to choose the name of the project, as depicted in figure XStudio.2. Write "XEOLibrary" as the project name and press next. (Project Names cannot have spaces, i.e. "XEO Library" is not a valid name, but "XEO_Library" or "XEOLibrary" are). In the next screen, depicted in figure XStudio.3 you need to choose the version of the XEO Framework to create the project with (XStudio.3 label 1), and for that you can use the default version bundled with XEO Studio, or choose the XEOCore.xar (more information about .xar files in the following sections) from the file system. (The XEOMeta option is not currently implemented). Next, you need to choose the J2EE Application Server (XStudio.3 label 2), currently only Oracle's OC4J and JBoss are supported directly in XEO Studio for development, but XEO will work with any compliant J2EE server. In label 3 and 4, (Figure XStudio.3) you choose the web context root for your web application and the port for you application. If you write xeo/8888 in the fields (respectively), your application will be accessible at http://localhost:8888/xeo. 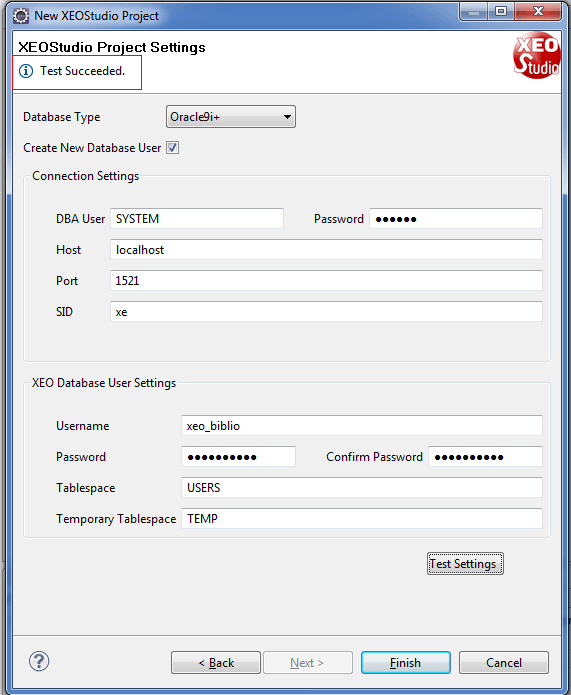 The XEO Database User Settings (label 4 in the figure) allow you to input your database user credentials (with Oracle's database you'll also need the Tablespace and the Temporary Tablespace). When all values are filled you need to press the "Test Settings" button (label 5, in figure XStudio.4) to check if everything is correct. If no problems occur the "Finish" button will become active so that the project can be created. A small message will appear at the top of the screen if everything is ok (see Figure XStudio.5). If anything is wrong, a popup with the error message will appear, describing the error. Pressing the "Finish" button will create the project in your workspace. When the wizard finishes, we can launch/deploy the project directly from Eclipse, because XEO Studio added a Degug/Run Launch Configuration to Eclipse for the project, as seen in Figure XStudio.5a. Open the "Debug Configurations" menu and select the newly created configuration. Eclipse will deploy the application in the application server (in this case, OC4J). After this, open your web browser and point it to http://localhost:8888/xeo/Login.xvw. Since it's the first time the project is deployed the XEO Builder will kick-in an make the initial build (see XEO Builder). The Build process is relatively quick in a new project (varies depending on database, Oracle is faster than MySQL) but depends on the number of XEO Models, because each XEO Model has to be converted to a Java class, compiled and then the database tables must be created/altered. This is done only the first time the project is created, when you add another XEO Model to your project only that Model will go through these steps (unless you force a complete build). When the XEO Builder finishes you'll be taken to the Login page (Login.xvw), use the default system username SYSUSER/ABC. It will redirect you to the Main_admin.xvw Viewer (see figure XStudio.5d bellow) where you can manage your XEO Application (from an Administrator's point of view), it will automatically open a tab with some statistics about your application. At this point your application is up an running and you could start creating new XEO Models and Viewers. Next you'll learn how a XEO Project is organized. Src - Java source code (your code goes in here, just like a regular Java Project). J2EE Libs, Modules, Module Libs - Where all the Jars that are required from XEO Core System and XEO Modules are placed. bodef - The folder where XEO Packages (which will contain XEO Models) are placed, includes a packages.xeodesc file with descriptions of each XEO Package. A XEO Package, each XEO Package can have any number of XEO Models, it can also have XEO Sub-Packages. XEO Lovs (List of values) - XEO Packages can store not only XEO Models, but also static lists of values which can be reused by the Models to declare the possible values of a given attribute, these are files have the *.xeolov extension. uidef/default - Default Profiles for the application, which will be discussed further in the documentation. Users in a XEO application can have profiles which may be used to restrict their actions. Files in this folder contain definitions of profiles to be created by the XEO Builder. Default web app - All your web resources (including *.xvw files [Viewers]) go in here. Why the $1.0/$2.0 in the package name? Historic reasons: The main purpose of those values is to help developers knowing the version of the package being used. In a long-term XEO application (and with the framework itself) packages undergo changes and maintenance and those changes are significant enough the version of the package may warrant a change. It's only a convention and does not affect the behavior of the platform. A XAR (Xeo ARchive) file is basically a container for XEO Projects (including the XEO Framework itself). The XEO framework is distributed inside a XAR file and you can also export a XEO Project as a XAR file and import that Project in another XEO Studio instance. XEO Modules are also installed (and distributed) using XAR files. 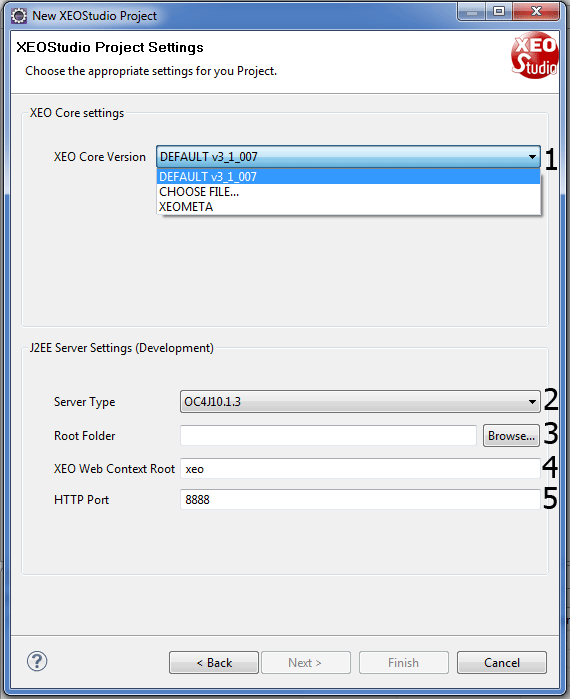 XEO Builder Integration with XEO Studio. As explained in the XEO Concepts section, at the heart of XEO is the Builder, which deals with the convertion of XEO Models to Java classes and Databases tables, their constraints, indexes, etc. XEO Studio has a direct connection to the Builder, which means each time a XEO Model is saved in XEO Studio, the Builder is invoked (the Builder knows which Models were changed since the last build). The process is depicted in figure XStudio7.a which shows what happens when a given XEO Model is saved. XEO Studio also registers in the console when the build started and when the build ended, as depicted in figure XStudio7.b. The XEO Builder is also available within every XEO application, you just need to go the builderApplet (http://localhost:8888/xeo/builderApplet.jsp) or login with SYSUSER/ABC with the "admin" profile (when you start a new project only this profile exists) and then find the XEO Model Builder entry in the menu. The builderApplet is depicted in figure XStudio.8, in which you can choose which operations should be executed in that build operation. In the next section you'll start by modelling the first Library XEO Model, and then proceed to the rest of the Models.